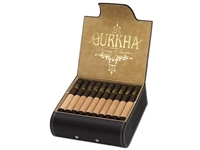 When your looking for a cigar that tastes just as good as it looks, Gurkha has the right smokes for you! With an inner core of Nicaraguan long-filler ligero, a second layer of Cameroon leaf binding it together and then rounding it off with a patiently fermented Cuban-seed Nicaraguan maduro wrapper that is not only covered with an oily shine but an even and dark coloring. Boasting earthy and sweet flavors mixed with an espresso kick this smooth and balanced cigar has been remarked as "the most complex cigar bearing the Gurkha name". Be sure to pick up your one of a kind, collectors full-grain leather box of cigars today!